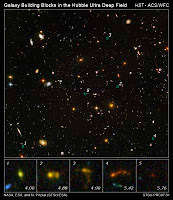 n this image of the Hubble Ultra Deep Field, several objects are identified as the faintest, most compact galaxies ever observed in the distant universe. They are so far away that we see them as they looked less than one billion years after the Big Bang. Blazing with the brilliance of millions of stars, each of the newly discovered galaxies is a hundred to a thousand times smaller than our Milky Way Galaxy. I always like to think that while we refrain from the actual Lego Building block that a child may use, the infancy in our views of the universe, are principles and terms that a condensed matter theorist might use. "I have never deviated from the name I use, so you get the sense of who I am. I do not see how "pushing back the physics and energies involved" would have made these issues abut cosmology inept or classed as fantasy in the making. Tim May, some things helped toward our understanding whether they are in the kitchen "to help gain in conceptual understanding, what others are less then able to explain in their opinion biased. Gabe:I really don’t have any knowledge of this, but: What exactly are they trying to say about liquid helium phases and extra dimensions? Has anyone has sufficiently answered Coin or Gabe in their questions to have offered a conclusion? Thanks Bee for challenging what would have otherwise been a chorus of the same ole, same ole." Now what choice do I have, if I were to comment on anything that had to do with what "String theory is doing?" Now, I would have supposedly worn out the title of any string theory article as coming from Zombie central. Now you know the title of this post and it's origination. The source of inspiration that allows me to comment and let stand, as to the substance of Peter Woit's post. The comments that come along as well. What more can I say, that by putting out front the reasons why this process is not just some fantasy woven for illusionists Peter seems to qualify. To all those who may speak toward the topic of string theory or not. Will media just leave it "to the expert" to speak for them and not challenge what is the highest opinion Peter has for the topic of string theory? I guess if you are not willing to do the work, then like Scientist, it is better to not write an article and let it die a quick death. Since I too cannot gain access to the Nature article without paying, I can only go by the "press releases" that Peter has been kind enough to show us. So these are directed to the Nature article. ow-temperature physicists at Lancaster University may have found a laboratory test of the ‘untestable’ string theory. The test – which uses two distinct phases of liquid helium - is reported online this week in Nature Physics (published 23 December). Their paper will also be published as the cover article in the paper edition of Nature Physics in January. String theory is a multidimensional theory based on vibrating strings, as opposed to the point particles described in the Standard Model. DOI: 10.1038/nphys815-Richard Haley, George Pickett and co-workers have taken a lateral step to address this barrier. They cool helium-3 isotope to a superfluid state — that is, a quantum fluid with non-classical properties such as completely frictionless flow. Adding a magnetic field creates a second superfluid phase, and the interface between these two phases behaves like a two-dimensional brane. Indeed, the collision of a brane–antibrane pair leaves traces of a stringy residue of defects: a tangle of vortices. Can you model what happened after the Big Bang in your lab? Helium-3 experiment replicates colliding-brane theory of cosmology. Yes, according to one group of physicists. A team at Lancaster University in the United Kingdom has used liquid helium and a magnetic field to build a finger-sized representation of the early cosmos. Their findings, published today in Nature Physics 1, could help string theorists to refine their models. The quality of the details of the comparison between 3He and cosmology is not really the point. Like a tap-dancing snake, what is amazing is not that it is done well, but that it is done at all. I can only assume that the example given is none other then what Peter has classified? 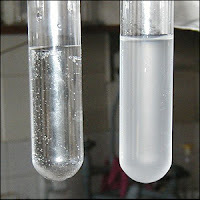 Does one of these test tubes hold a baby Universe? The test tube, the size of a little finger, has been cooled to a fraction of a degree above the lowest possible temperature, absolute zero, which is just over 273 degrees below the freezing point of water. Inside the tube an isotope of helium (called helium three) forms a "superfluid", an ordered liquid where all the atoms are in the same state according to the theory that rules the subatomic domain, called quantum theory. What is remarkable is that atoms in the liquid, at temperatures within a thousandth of a degree of absolute zero, form structures that, according to the team at Lancaster University, are similar those seen in the cosmos. "In effect, we have made a universe in a test tube," says Richard Haley, who did the work with Prof George Pickett and other members of the "Ultra-low Temperature Group." Now, just hold your horses here while we consider not only the context of this article by Richard Highfield, but of the very questions I myself have asked that we might consider the context of the Telegraph article other then contributing to Zombie Central. It is true that there has been a lot of debate about how information currently being dealt within in science articles are giving concern to people at the forefront of science. So in this effort I see what Peter is saying. Scientists are indeed asking for this responsibility, and not just of the media themself , but of the individual in their "pursuit of the truth" of what is being portrayed out there in the science media's global vision. I do not sanction "the classifications" that have been drummed up by Peter Woit, from intelligent design theorists, to Zombies. The View of the Cosmos? Now why is it that we would look to the cosmos and ask ourselves about the views that would happen in the context of universal display, as having some relevances to the microsomal world that surrounds us. Over and over again, we are directed to applications of what happens in that cosmos as experimental processes which reveal the origins of the universe in that microcosm view? So they use a test tube. The origins of life has it's basis in that tube on a simplistic level, whether you'd like to think so or not. Would it have been better to use the "image of the tube" and an emergent image of the colliders over top of it, as a better view of the microscopic view of the world we live in? Many physical quantities span vast ranges of magnitude. Figures 0.1 and 0.2 use images to indicate the range of lengths and times that are of importance in physics. Many of us understand the powers of ten, Qui? views of the vortices, is not so uncommon that we can see such vortices out there in the cosmos and not draw some conclusion to the "relativistic interpretation" that may arise in some super fluid? I can understand Tim May's "bubble in the test analogy in the kitchen," but I would have drawn a better parallel to sonofusion(you can find examples of this on this site) as an example about reduction to the "principals of the early universe." While I see such collapse dynamically related to "gravitational collapse" this is my view with regards to the increase in temperature values that may have been attributed to the ideas about the energy increase in blackhole development and motivation for providing the routes for cosmological expansion rates. An analogy, yes. The escape pathway for that "extra energy" to loose itself, while the computations of the values of particle creations are left for inspection. Where did that extra energy go? Is it such a "bad question" to have when looking at the microscopic view of particle creation in the birth of our cosmos? To have the universe being in such a cosmological state, that the variance of speed of expansion shall vary? Explained, with such a idea? In writing this review, we have tried to discuss the different building blocks that are needed if one wants to construct a relativistic theory for fluids. Although there are numerous alternatives, we opted to base our discussion of the fluid equations of motion on the variational approach pioneered by Taub  and in recent years developed considerably by Carter [17, 19, 21]. This is an appealing strategy because it leads to a natural formulation for multi-fluid problems. Having developed the variational framework, we discussed applications. Here we had to decide what to include and what to leave out. Our decisions were not based on any particular logic, we simply included topics that were either familiar to us, or interested us at the time. That may seem a little peculiar, but one should keep in mind that this is a “living” review. Our intention is to add further applications when the article is updated. On the formal side, we could consider how one accounts for elastic media and magnetic fields, as well as technical issues concerning relativistic vortices (and cosmic strings). On the application side, we may discuss many issues for astrophysical fluid flows (like supernova core collapse, jets, gamma-ray bursts, and cosmology). In updating this review we will obviously also correct the mistakes that are sure to be found by helpful colleagues. We look forward to receiving any comments on this review. After all, fluids describe physics at many different scales and we clearly have a lot of physics to learn. The only thing that is certain is that we will enjoy the learning process! So you understand that the views of the string theorist is not limited to the microcosmic view, but endorses the cosmological one as well. :) See the Lagrangian views supplied on this site to understand how gravity has been incorporated in the cosmological view. The amount of matter, or "mass," in a galaxy is made up mostly of the gas that surrounds it. Stars, planets, moons and other objects count too, but a majority of the mass still comes from the hot, glowing clouds of hydrogen and other gases. When the Bullet Cluster's galaxies crossed and merged together, their stars easily continued on their way unscathed. This may seem a bit perplexing, because the bright light of stars makes them appear enormous and crowded together. It would be easy to expect them to smash into each other during their cosmic commute. But the truth is, stars are actually spaced widely apart and pass harmlessly like ships on an ocean. The gas clouds from the merging galaxies, however, found the going much tougher. As the clouds ran together, the rubbing and bumping of their gas molecules caused friction to develop. The friction slowed the clouds down, while the stars they contained kept right on moving. Before long, the galaxies slipped out of the gas clouds and into clear space. 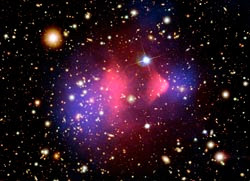 With the galaxies in open space, Chandra scientists found dark matter hiding. We can make certain conclusion about our universe given some insight into the geometric way our universe as a whole exists now? Lets first look at what Sean Carroll has to say and then we can go from here. This is a review of the physics and cosmology of the cosmological constant. Focusing on recent developments, I present a pedagogical overview of cosmology in the presence of a cosmological constant, observational constraints on its magnitude, and the physics of a small (and potentially nonzero) vacuum energy. What better way to speak to the content of the universe if you cannot look at the way it is now. It's current "geometric implication" as a result of the parameters we have deduced with WMAP, and resulting information on the content of the dark matter/energy within the universe? While people are drawn to the "micro-perspective" it is in face of this, that I fall behind on the "many blog postings" and "current events." I try to maintain a perspective about GR and the development of this process through understanding the history. I also pay attention to those who use "relevant phrases" to let me know they are continuing to read this blog site. Even in face of the layman status I have. I pay attention also to the information they are imparting and try to incorporate new information from their blogs, within the scope of my understanding, to make sure that I am not misleading others. Thinking this artist( in the conceptual developmental phases) has some wish to be firm in the places science is currently residing. So some are quick to call Kip Thorne and his ilk the fantasy and science fiction editors of our times, when progressing to the new movies they will collaborate on. So maybe rightly so here. But to bunch them into the likes of string theorists, to somehow further their goal on their own "mission to enlighten," how Peter Woit do you think so? Thorne expects that nothing in the film will violate fundamental physical law. He also seems rather involved in fantasy as well as science fiction, believing that the LHC has a good shot at producing mini-black holes, and that String theory is now beginning to make concrete, observational predictions which will be tested. The very basis of research and development "has a long arm here" developed from the likes of the "small interferometer that we know "works," as a qualitative measure of the fabric of our universe, as the Ligo Operation. Don't be so smug to think that what is fantasy in the world of good science people was somehow related to "what you may think" and does not have any validity in the mathematical realm of the string theoretical development. It all happens in stages as we all know to well? Susan Holmes- Statistician Persi Diaconis' mechanical coin flipper. In football's inaugural kickoff coin toss, the coin is not caught but allowed to bounce on the ground. That introduces an extra complication, one mathematicians have yet to sort out. There is always an "inverse order to Gravity" that helps one see in ways that we are not accustom too. The methods of "prospective measurements" in science have taken a radical turn? Satellites as a measure, have focused our views. 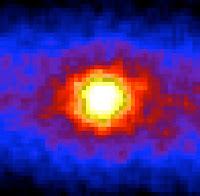 While one may now look at the "sun in a different way" it had to first display itself across the "neutrino Sudbury screen" before we knew to picture the sun now in the way we do. It was progressive, in the way the sun now forms a picture of what we now know in measure. So you try and bring it all together under this "new way of seeing" and hopefully your account of "the way reality is," is shared by others who now understand what the heck I am doing? 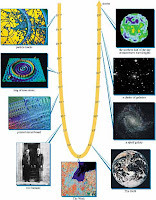 "Uncertainty" has this way of rearing it's head once we reduce our perspective to the microscopic principals(sand), yet, on the other side of the coin, how is it that only 5% of mass determination allows us to see the universe mapped in the way it has in regards to the CMB? There is this "entropic valuation" and with it, temperature. Some do not like the porridge "to hot or to cold," with regards to "living in a place" within the universe. So I'll repeat the blog comment entry here in this blog so one can gather some of what I mean. :)Something good science people "do not want to hear?" The launching of the sound waves is very similar to dropping a rock in a pond and seeing the circular wave come off (obviously that a gravity wave, not a compressional wave, but I’m focusing on the geometry). 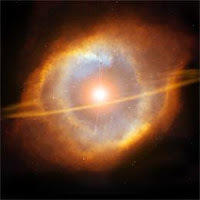 The difference here is that the area where the “rock” entered is still the most likely region to form galaxies; the spherical shell that it produced is only carrying 5% of the mass. Hopefully, this demystifies the effect: we’re seeing the imprint of spherical sound waves launched from the sites of dark matter overdensities in the early universe. But also I hope it makes it more clear as to why this effect is so robust: the propagation of sound in the baryon-photon plasma is very simple, and all we’re doing is measuring how far it got. "Mapping," had to begin somewhere. Whatever that may mean,one may think of Mendeleeev or Newlands. Generally Grouping Order increases the density of objects within a frame of reference, resulting in a more pronounced single object. "Sand with pebbles" on a beach? It had to arise from someplace? The other side of the Coin is? and not to be undone. Mass results in an increase in the gravitational force exerted by an object. Density fluctuations on the surface of the Earth and in the underlying mantle are thus reflected invariations in the gravity field.As the twin GRACE satellites orbit the Earth together, these gravity field variations cause infinitesimal changes in the distance between the two. These changes will be measured with unprecedented accuracy by the instruments aboard GRACE leading to a more precise rendering of the gravitational field than has ever been possible to date. So now that you have this "comprehensive view" I have gained on the way I am seeing the universe. You can "now see" how diverse the application of sound in analogy is. It is helping me to develop the "Colour of Gravity" as a artistic endeavour. I refrain from calling it "scientific" and be labelled a crackpot. A Synesthesic View on Life. Who knows how I can put these things together and come up with what I do. Yet, it had not gone unnoticed that such concepts could merge into one another, and come out with some tangible result as a "artistic effort." Some may be used to the paintings of Kandinsky(abstract), yet the plethora of imaging that unfolds in the conceptual framework might have been self evident, from such a chaotic mess of the layman's view here? Click here to watch Kip Thorne on Space Place Live. 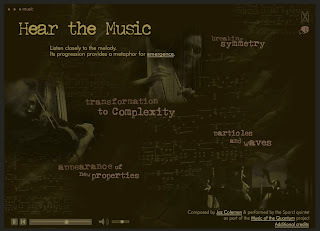 The "Color of Gravity to Sound" forces perspective. What can I say? It becomes an exercise into an artistic adventure. So there has to be a historical development in any idea to express gravity in such a way. So you develop new ideas, learn that detection methods in the aluminum bar for gravity detection holds ameaning for a new enquiring mind. What was Webber doing? Did Einstein hear gravity in such a way? He knew to measure time in terms of the hot stove and a beautiful girl? The "visible" images in the viewer are what we see with our unaided eyes or ordinary telescopes. The other images shown here were made by instruments that detect light our eyes cannot see. Then those images were colored so that we can see what the instrument saw. If a "wavelength" appears darkened in the viewer for a particular object, that means we don't yet have an image of that object in that wavelength. So we develop our measures and apply our colours. How nice these pictures look? Everybody's view the same. This a person's coloured view of the world around them. The gravity of their situation. If we were to say that all life was expressed in such a way what would the vibrancy of our emotive states scream, if love is splashed onto a screen, or "anger" stopping in the red? A man sits under heavy questioning. There are no lie detectors attached to his being. No way is there a better way then to know that his voice, his disposition, cannot hide a lie he might like to tell? The colour tells all, and the deception, is the man's grounded position on life and truth he acquired. The search for this "cup that overflow" is at the heart of all who venture for the lifeblood of the mystery of life. While Atiyah speaks to a unification of Quantum theory and Relativity, it is not without a understanding on Einstein's part that having gained from Marcel Grossmann, that such a descriptive geometry could be leading Einstein to discover the very basis of General relativity? 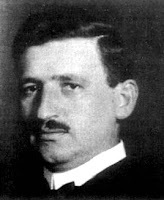 Marcel Grossmann was a mathematician, and a friend and classmate of Albert Einstein. 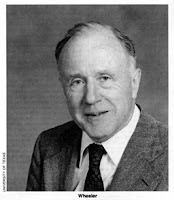 He became a Professor of Mathematics at the Federal Polytechnic Institute in Zurich, today the ETH Zurich, specialising in descriptive geometry. Died: 28 July 1818 in Paris, France-was a French mathematician and inventor of descriptive geometry. 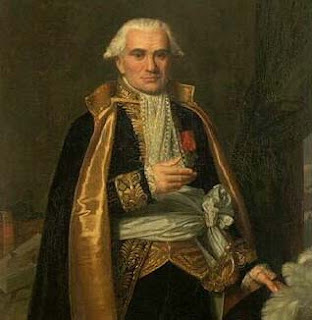 Monge contributed (1770–1790) to the Memoirs of the Academy of Turin, the Mémoires des savantes étrangers of the Academy of Paris, the Mémoires of the same Academy, and the Annales de chimie, various mathematical and physical papers. Among these may be noticed the memoir "Sur la théorie des déblais et des remblais" (Mém. de l’acad. de Paris, 1781), which, while giving a remarkably elegant investigation in regard to the problem of earth-work referred to in the title, establishes in connection with it his capital discovery of the curves of curvature of a surface. Leonhard Euler, in his paper on curvature in the Berlin Memoirs for 1760, had considered, not the normals of the surface, but the normals of the plane sections through a particular normal, so that the question of the intersection of successive normals of the surface had never presented itself to him. Monge's memoir just referred to gives the ordinary differential equation of the curves of curvature, and establishes the general theory in a very satisfactory manner; but the application to the interesting particular case of the ellipsoid was first made by him in a later paper in 1795. (Monge's 1781 memoir is also the earliest known anticipation of Linear Programming type of problems, in particular of the transportation problem. Related to that, the Monge soil-transport problem leads to a weak-topology definition of a distance between distributions rediscovered many times since by such as L. V. Kantorovich, P. Levy, L. N. Wasserstein, and a number of others; and bearing their names in various combinations in various contexts.) A memoir in the volume for 1783 relates to the production of water by the combustion of hydrogen; but Monge's results had been anticipated by Henry Cavendish. Monge's protocols allow an imaginary object to be drawn in such a way that it may be 3-D modeled. All geometric aspects of the imaginary object are accounted for in true size/to-scale and shape, and can be imaged as seen from any position in space. All images are represented on a two-dimensional drawing surface. Descriptive geometry uses the image-creating technique of imaginary, parallel projectors emanating from an imaginary object and intersecting an imaginary plane of projection at right angles. The cumulative points of intersections create the desired image. So given the tools, we learnt to see how objects within a referenced space, given to such coordinates, have been defined in that same space. Where is this point with in that reference frame? What is born within that point, that through it is emergent product. Becomes a thing of expression from nothing? It's design and all, manifested as a entropic valuation of the cooling period? Crystalline shapes born by design, and by element from whence it's motivation come? An arrow of time? The most famous 4 x 4 magic square is the so-called Melancholia magic square. In 1514, Albrecht Dürer used the square in his engraving Melancholie which depicts the indecision of the intellectual. The two numbers, 15 and 14, in the centre of the bottom row date the engraving. This image above I have discussed before in this website. It is also in the legend on the right hand side of this web page. It is always important to see the progression geometries follow. So you have to know "the origins of geometry" before you can begin to expand into the abstract spaces that space will allow and accomadate.